Where am I? 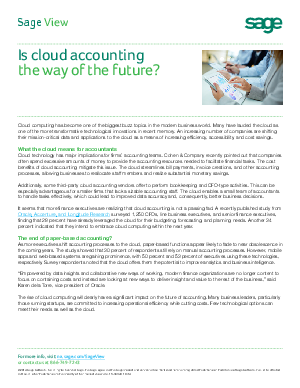 › Home > White Papers > Sage > Is Cloud Accounting the Way of the Future? Cloud computing has become one of the biggest buzz topics in the modern business world. Many have lauded the cloud as one of the more transformative technological innovations in recent memory. An increasing number of companies are shifting their mission-critical data and applications to the cloud as a means of increasing efficiency, accessibility, and cost savings.